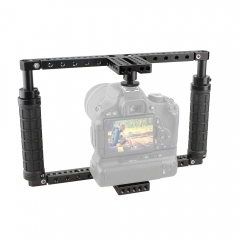 The Camera Cage is entirely made of hard anodized aluminum for durability. 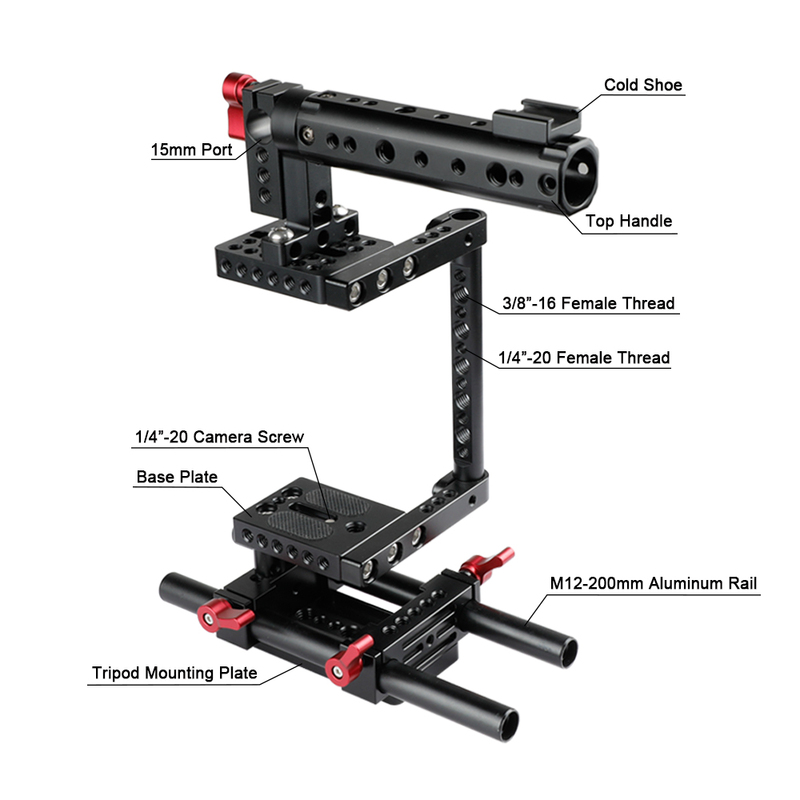 It comes with 2pcs 20cm length aluminum rods for mounting matte box, follow focus, LED lights, and other accessories while protecting cameras or DVRs. Designed to work with most of the models for Canon, Nikon, Sony, Panasonnic. 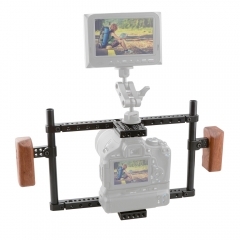 It is ideal for professional or amateur cameraman and filmmaker. 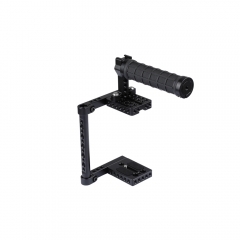 Camera Cage：There is a 1/4" mounting screw on the camera baseplate, it is easy to tighten your camera. Black rubber washer protect your camera from damage. 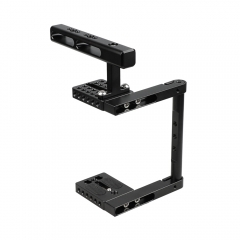 Comes with 2pcs side pipes of different length for different brands of camera. Side pipes provide a plenty of 1/4"-20 and 3/8"-16 thread holes. 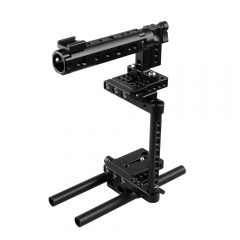 Tripod Mount Plate：Provides 4 1/4"-20 threaded holes and 3 3/8"-16 threaded holes for standard tripods. Comes with 2 15mm railblocks for better stability. 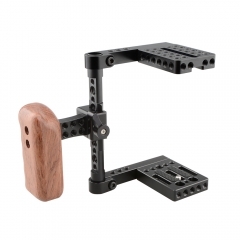 Top Handle: Comes with a single rod clamp and a hot shoe mount, which allows you to extend and DIY. It also provides a plenty of 1/4"-20 and 3/8"-16 thread holes. 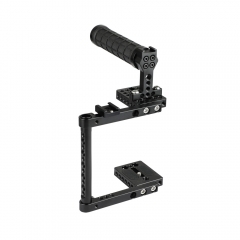 Two 20cm aluminum rods included, allows you to easy mount capability for follow focus, matte box and more. All knobs comes with adjustable design. 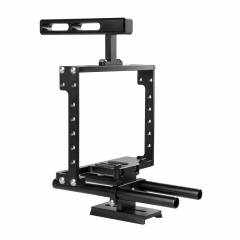 Made of solid aluminum, CNC machined, sturdy and durable. The side cheese rod 125mm long is compatible with Canon EOS M3, 650D, 600D, 550D, 500D, 450D, 760D,750D, 700D, 1200D,Nikon D3200, D3300, D5200, D5500, Panasonic GH5,GH4,GH3,GH2,G7,Fufifilm X-T2; The side cheese rod 145mm long is compatible with Canon 80D, 70D, 60D, 50D, 40D, 30D, 6D, 7D, 7D MarkII, 5D MarkII, 5D MarkIII, 5DS, 5DSR, Nikon D7000, D7100, D7200, D300S, D610, D810,DF,etc.